The "Threads of Time" exhibit contains a wide variety of dulemola, created using an elaborate, reverse appliqué technique where artisans layer colorful fabrics then cut them away to reveal intricate patterns. This contemporary example features paliwiduru, or eagle spirits. Renee Stein, head of conservation for the Carlos Museum, describes some of the methods used to examine, stabilize and mount the textiles, one of the trickiest media of all to display safely, for the “Threads of Time” exhibition. • Llamas, alpacas or vicunas? Several fiber analysis projects were conducted on the textiles in the “Threads of Time” exhibition, one showing that pieces from Bolivia were mostly from camel fibers. In order to identify which camels, and distinguish them from sheep’s wool, fibers were scanned at Emory’s electron microscopy center. • What plant or animal did they use to dye? Tiny lengths of threads went to an expert at Eastern Michigan University to analyze them for what dyes were used and when they were made. Purple can come from a sea snail or from a chemical in modern times, while red may come from a plant or from hundreds of dried, pulverized beetles in ancient pieces. • The restoration and preservation work of the conservation staff allows for some pieces to be taken into the classroom, where Emory students have the privilege and opportunity to see something that is as much as 1,800 years old without hurting it. Culture and history are fashioned into a colorful and informative exhibition now open at Emory's Michael C. Carlos Museum. “Threads of Time: Tradition and Change in Indigenous American Textiles,” a major exhibition on textiles native to South and Central America, will be on display through Dec. 17 in the third-floor galleries of the Carlos Museum. The museum’s permanent collection contains over 700 examples, of which 149 will be on display, many for the first time. In addition to showing what Andean, Maya and Guna indigenous people wove and wore, the exhibition is the museum’s first ever with an accessible online catalogue (prepared with the assistance of the Emory Center for Digital Scholarship), notes Rebecca Stone, professor of art history and faculty curator of the Art of the Americas. The catalogue has eight essays, information from all the labels and other instructional materials in the show, and professional color photographs that viewers can zoom in on to see more detail. Textiles are not just for creative expression, looking pretty, keeping warm, or covering up — especially in South America, where they have what Stone calls “textile primacy.” A number of the woven objects in the exhibit date from 1000 to 1600 A.D., with the oldest piece in the show dating to between 100 and 200 A.D.
“They perform almost every function and also act as works of art as well," she explains. "In the Andes, the dry coast, high mountains and wet rainforest environments each mean that fiber is a great solution. Carrying cloths for long treks, fishnets for garnering protein, hammocks to sleep in, rope bridges over chasms — you name it, a textile can provide a good solution to the problem." Clothing is also the key to gender, status, role, ethnicity, time period and wealth, Stone noted. The exhibition features intricate designs and vibrant pieces made from self-colored and naturally dyed cotton and animal hair, first from indigenous camels such as the alpaca then including the Spanish-introduced sheep’s wool. Later materials include polyester and chemical dyes known as aniline developed in the mid 19th century. All these materials and colorants demonstrate the layers of history, and reflect the theme of the exhibition, the combination of the original indigenous culture with that brought in by the Spanish conquerors, colonists and missionaries. 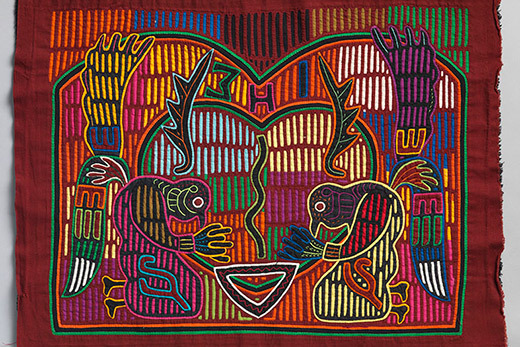 The combination of cultures is clearly shown in an extensive display of cutwork “molas” – panels inserted into blouses imposed by missionaries – sewn by Guna inhabitants of the north coast and offshore islands of northern Panamá. The elaborate, reverse appliqué patterns were not possible until the Guna women artists had access to European scissors; however, instead of adopting European quilting techniques, which create patterns by adding layers of cloth in different shapes, the indigenous artisans layered the colorful fabrics, then carefully cut them away to reveal intricate designs. In the show, there are geometric patterns that reference the Guna belief in an eight-layered labyrinthine universe, plus diverse Caribbean flora and fauna important to their survival. One striking black-and-red example combines the two: a long stare at a series of spirals reveals a mother bird feeding her chick, the two connected at the beaks. Similarly, Stone calls a Maya shaman’s textile the “poster child for syncretism — where worlds collide” as she describes how it was used in the Guatemalans’ parallel practice of indigenous religion and Catholicism. A shaman may even bring his sacred bundle into the Catholic mass to continue healing his client. Three items that represent weddings — ruffles, lace, brocade — locate them half-way between the Mayan and the European cultures as well. "Threads of Time" also features a gallery of looms and weaving tools, including the portable, foldable backstrap loom used for about 5,000 years, able to weave the cloth and introduce the pattern simultaneously. “It just looks like a few sticks. It’s not an elaborate technology," Stone says. "One of the points I want to make is the technology does not have to be complex for the results to be remarkable." A beautiful wooden Santo figure from the late 19th century with glass eyes. “We’re almost sure it’s St. Joseph, the patron saint of the Americas,” Stone says. On display with St. Joseph are pieces of clothing made for such figures. Textiles as writing. The Inka of Andean South America used hanging, knotted threads, Stone says, in one of the only instances in which people used “knot records, kind of like computers, where everything is coded” to communicate, a form of writing later outlawed by the Spanish. View the Carlos Museum calendar for a variety of events related to the "Threads of Time" exhibit, including gallery talks, lectures and hands-on art workshops for children, teens and adults.